"Andinoacara rivulatus Licensed under CC BY 2.5 via Wikimedia Commons. Max. 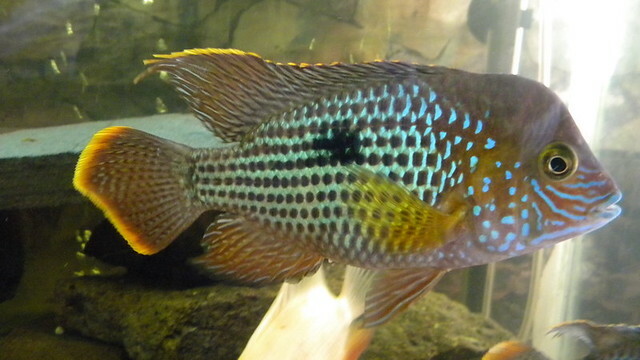 Size In Aquarium: Up to 8"
The Green Terror is a beautifully marked cichlid. Its body is a greenish white with many electric blue spots on the chin area. The males of this species have a longer tail fin, which is outlined in red. The Green Terror requires an aquarium of at least 50 gallons, with a sandy bottom, and rock work that will provide plenty of hiding spots. Live plants should be planted in pots to protect the roots from these fish. The Green Terror is generally peaceful with other fish of similar size, but can get more territorial as it matures. The Green Terror is an open-breeder and will accept a range of water conditions. The Green Terror readily pairs and the female will take the bigger role in raising the fry. The female will lay the eggs on a cleaned, flat rock. They will spawn about every two weeks if the young are removed from the aquarium. 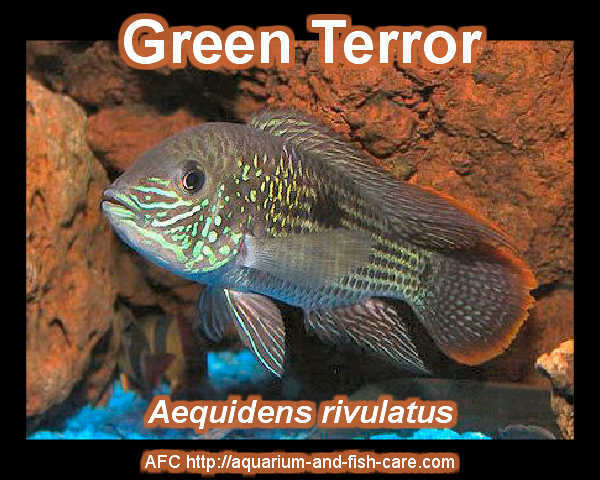 The Green Terror is omnivorous and will eat most prepared and frozen foods, including freeze-dried bloodworms, tubifex, and ocean plankton, as well as flake food and Cichlid pellets.